The SMRT36 is a smaller and lighter protective relay test set, and has more output power than any other comparable three-phase instrument available anywhere. The SMRT36 has a unique constant power output, produces a compliance voltage of 50 V at up to 4 A (200 VArms), and maintains 200 VA output power up to 30 A, making it ideally suited for testing in today's installations and legacy plants. Also, with its forward thinking design, the SMRT36 is positioned for future challenges associated with smart grid testing. 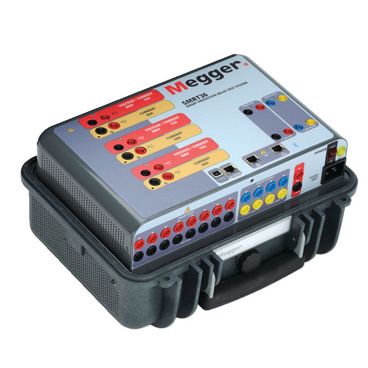 The SMRT36 is Megger's fourth generation of automated relay test sets. This test set takes full advantage of Megger's patented developments from previous models to produce an instrument that offers greater precision than its predecessors, with reduced size and reduced weight of only 12 kg. The SMRT Power Box is specifically designed to test protective relays that are used in conjunction with CTs having 1 A and 5 A secondaries. It combines the capacity to simulate high current faults with the amplifier precision needed to satisfy even the most demanding requirements. The instrument has three current output channels, plus three convertible channels that can be configured as either voltage or current outputs. This makes it possible, for example, to test numerical current differential relays that require six currents. Its patented design allows the SMRT36 to deliver high power in both the voltage and current channels as needed in high-burden applications, such as testing electromechanical relays. The unique Constant Power Output of the current amplifiers produces a compliance voltage of 50 V at up to 4 A (200 VArms), and maintains 200 VA output power up to 30 A. Two current outputs can be series connected to double the compliance voltage to 100 V and provide a constant 400 VA output power at 4 A and up. To facilitate panel testing, and the testing of high-burden electromechanical distance protection relays, the high constant power output is also available from the new PowerV voltage amplifiers. From 30 V to 150 V, these deliver a constant 150 VA, providing high current output at difficult low test voltages. Of equal benefit is high-current output capability. The new SMRT current amplifiers can deliver 30 A per phase continuous and up to 60 A per phase for short durations. For instantaneous overcurrent test applications, the SMRT36 can provide up to 180 A at high power. Megger's new SMRT36 Protective Relay Test Set can be controlled manually with the optional Smart Touch View InterfaceTM (STVI), which provides a simple way of testing even the most complex relays. The STVI, with its large full-color high-resolution touch screen, allows users to perform manual, steady-state and dynamic tests quickly and easily, and has built-in preset test routines for most popular relays. 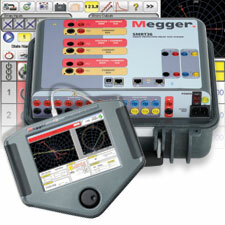 For fully automated testing, the SMRT is supplied standard with AVTS, Megger's advanced visual test software package.